KANNADA SANGHA Presented Sangeetha Katti Kulkarni with her accompanying artists on the 20th of June in a evening of Swara Madhurya. 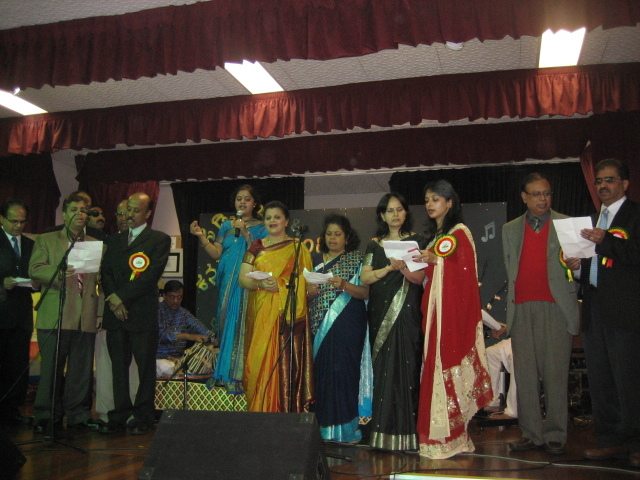 The evening held at the Ryde Performing Arts Hall in Cox’s Road turned out to be a rather cosy affair mainly fostered by the Kannada community in Sydney. Guest speakers’ local mayor, multicultural affairs minister, important members of UIA were all present for most of the evening. The evening started with Sangeetha singing various popular Kannada songs which was a hit with its audience followed by the icing on the cake when she stood up to render to the musical score of AR Rahman ‘Vande matharam’. In a heartwarming rendition she reached the hearts of the audience who also stood up during this song. After seeking several requests from the audience, she sang another popular number joined this time by members of the Committee and other local singers who joined her on stage. Her easy going attitude towards her performance made both the singers and the audience feel at home. In the second half of the programme Sangeetha classically trained by the musicians personified, such as Kishori Amonkar and Basavraj Guru, sought to teach the audience the basic scale of Raag Yaman. She sang several film songs in this raga and finished it with a classical number. Sangeeta certainly knew how to keep her audience, her accompanying artists and not surprisingly, the sound man, who perhaps had the busiest job in the room happy. I left just as she was receiving further offers to sing other songs. A memorable resounding voice and a beautiful evening that filled the hearts of the Kannada community in Sydney not to mention their palate which was fulfilled with a sumptuous meal during the break.